Before the month is over, and wanting to have a posting on Leap Year Day, here is something at the Historical Society. No, I have not changed my mind from my last post. I still think Valentine’s Day is for people with not a romantic bone in their bodies. 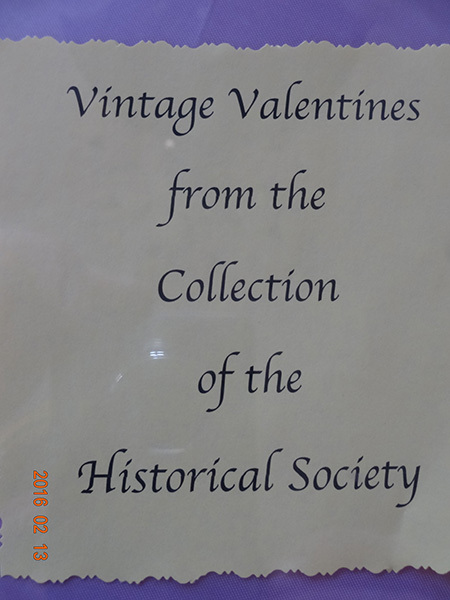 However, in honor of the day, the Historical Society installed a display of Valentines from the past. Many of them look to be from the late 19th-early 20th century. For those you who like Valentine’s Day, enjoy. For those of us who don’t, it’s still interesting to look at artifacts from a bygone era.